Sometimes trying to make an HF antenna fit into your backyard is like trying to make a size 14 woman fit into a size 8 dress... Some things are just not meant to be. Enters the magnetic loop. It's fairly small, decently efficient (I hope), and fairly easy to build. There is no free lunch, especially when it comes to the laws of physics, so something has to give. For one, they produce voltages and RF that will fry your pacemaker in a heartbeat (your last..). Bandwidth is as thin as an airplane sandwich and they require expensive high voltage variable capacitors, air type (if you're lucky), vacuum (if you're rich). I decided to build one out of 1" copper tubing. It worked very well for my Slim Jim 2m antenna, so I have high hopes for the magnetic loop. Most of the information came from Frank (N4SPP), and I thank him profusely here for writing his excellent article: http://www.nonstopsystems.com/radio/frank_radio_antenna_magloop.htm. He even sent me screen shots of the RJELOOP1 software used to calculate all the loop parameters. I later was able to run it on my Mac using DOSBOX, a DOS emulator. The software was designed by the late Reg Edwards, UK Amateur Radio Station G4FGQ and can be found here: http://www.zerobeat.net/G4FGQ/page3.html. I wondered how big I should make it. My requirements were only that it fits through a regular door frame and covers 40m. It just happens that a 6'3" tall loop works perfectly for 40/30/20m! I will be feeding the loop through a FT-240-31 toroid, which I already have: Fair-Rite part number 2631803802: http://www.fair-rite.com/cgibin/catalog.pgm?THEONEPART=2631803802. The capacitor is an air type, 9-110pf 4KV (CAV 12-23): http://www.surplussales.com/Variables/AirVariables/AirVar1.html. It won't be as easy to tune as a multi-turn vacuum capacitor or take as much power, but I am not spending $250! It should arrive on Wednesday. Now I need to go to the hardware store! 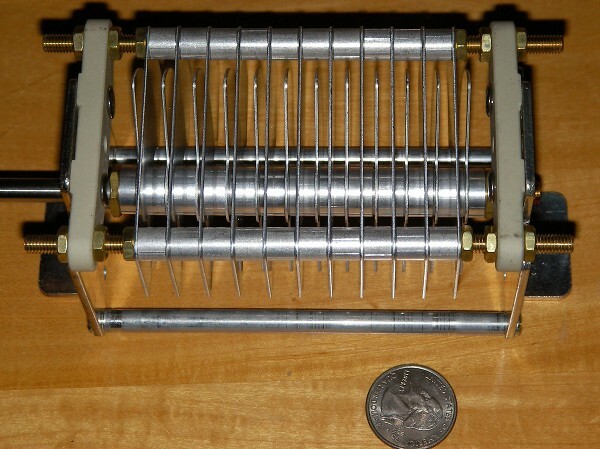 Re: A magnetic loop antenna for 40/30/20m. 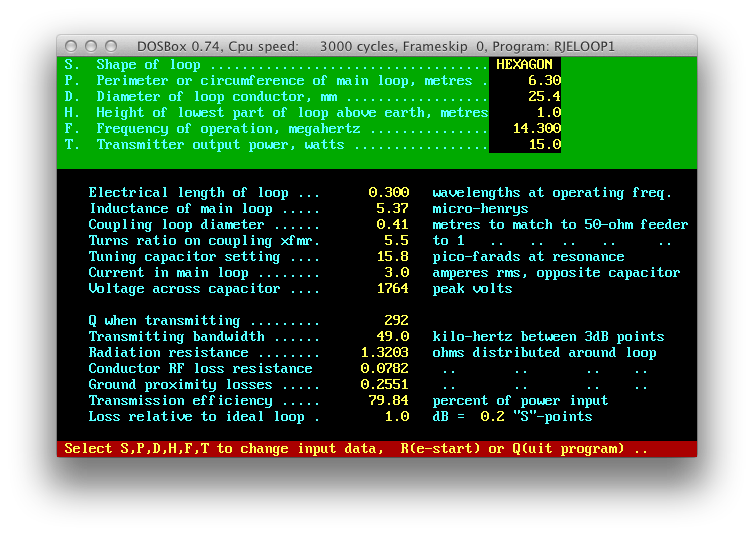 Have you any performance report on the magnetic loop? And while $250 is expensive - $460 for the MFJ Super Hi Q version is unbelievable for a stealth antenna! Also, it seems that it would EAT electrical power? If so, that would make it stealthy, but not practical for a shtf event! So, I will be interested in following your progress reports on this project Gil! How much copper do you need? Maybe we'll make two...? Not sure, it's 21' of 1" tubing plus 45deg elbows. I have a torch, solder is pricey too, but I don't think it would be too much. Much much less than the MFJ antenna in any case. What's needed for the antenna is four 5' 1" tubes. You cut them in half to make the eight 2.5' segments. I have two ferrites for feeding the loops. The magnetic loop is up! I went to Home Depot today and bought four 5' lengths of 3.4" copper tubing, as well as eight 45deg elbows. It took me a few hours but it works! One thousand mile QSO with a RST of 559 tonight! The toroid core takes four turns of 14ga wire for best SWR, which varies between 1.2:1 to 2:1. the tunig is extremely touchy. I wish I could have afforded a multi-turn variable capacitor.. The loop has a 6ft. diameter. I put a coupling on the bottom, so it can be disassembled in two pieces. The capacitor comes off too. I can change polarization simply by putting it on it's side. It does seem less noisy than my verticals. I haven't tried it on 20m, only 40 and 30. The band isn't great tonight, but the first test is a success! Excellent! Have you tried it on 40m SSB? I still have one capacitor and a a FT-240-31 toroid... Hum... What should I do? A 3ft diameter 15/17/20m loop! This is REALLY excellent news! 559 on forty into Kanses aith 14 Watts max, using an indoor, homebrew magnetic loop. . . That is really excellent proof that it's doing it's job and radiating well. Any change to prop it up outside on the balcony? Here it is with a size reference. I'm 6'2"
Tonight, Russia on 6W: 5900 miles! You know - a two way contact with Russia from the southern united States would be good enough with 100 Watts and a full sized dipole up 60 feet, but doing it with a home made 6 Watt transceiver into a home made magnetic loop, located inside of your home - that's excellent! It also seems that the loop might have dramitically improved your signal to noise ratio on receive and that's critical - especially in an urban environment. These two antennas will be cheaper than the big loop. No elbows to buy, little soldering, and for the small loop, a smaller capacitor. I just ordered the toroids.. I am also looking for a 300pf 2500V capacitor to use in parallel with the air capacitor on my big loop and tune 80m. Performance will be low, but at least it will work!